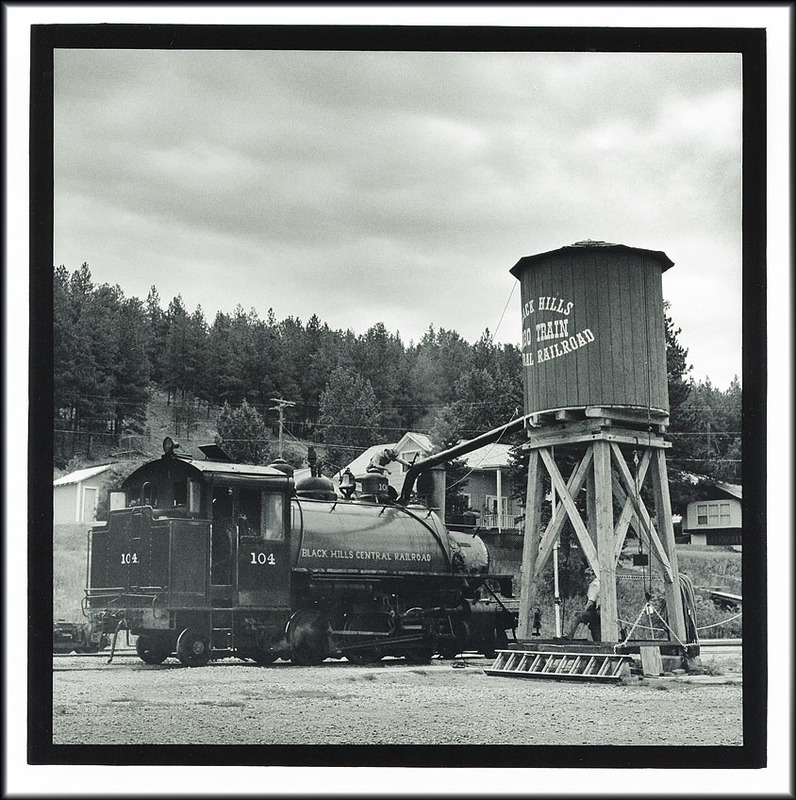 The various trips to the United States developed my interest in history of the Old West. 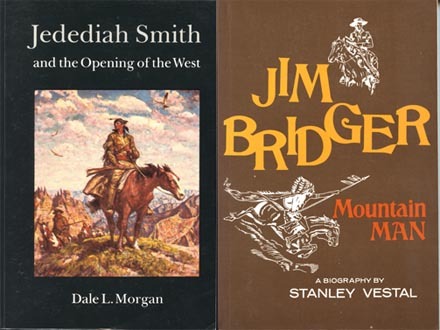 Over the years I bought a number of books written by / about mountain men and trappers such as Jedediah Smith, Joe Meek, James Clyman, Jim Bridger, etc. 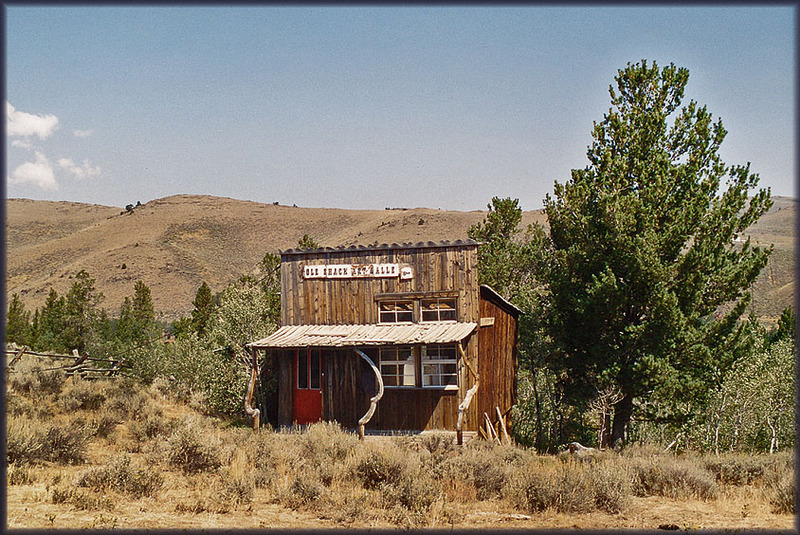 I also researched locations and conditions of ghost towns. 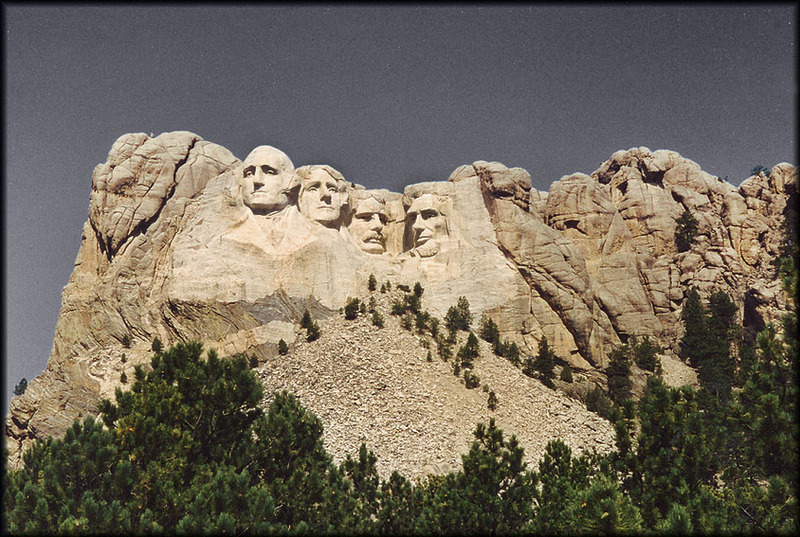 So a visit to Wyoming became inevitable, particularly with the possibility of combining Mount Rushmore and Yellowstone Park (again). 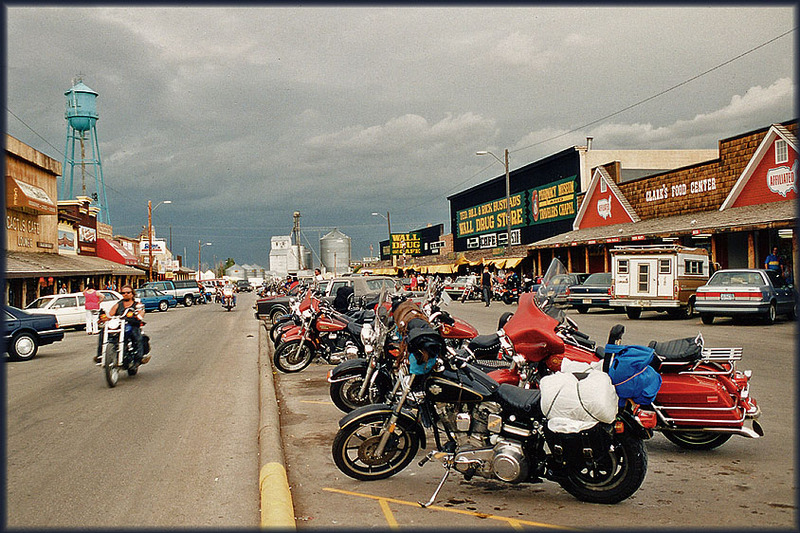 The fact that we landed in the middle of the Sturgis Motorcycle Rally was pure coincidence, and a very fortunate one. Martinair was the only carrier operating direct trans-atlantic flights to Denver,CO (Stapleton IAP) at the time (this service lasted only a few years), so we started in Denver and drove a triangular routing. 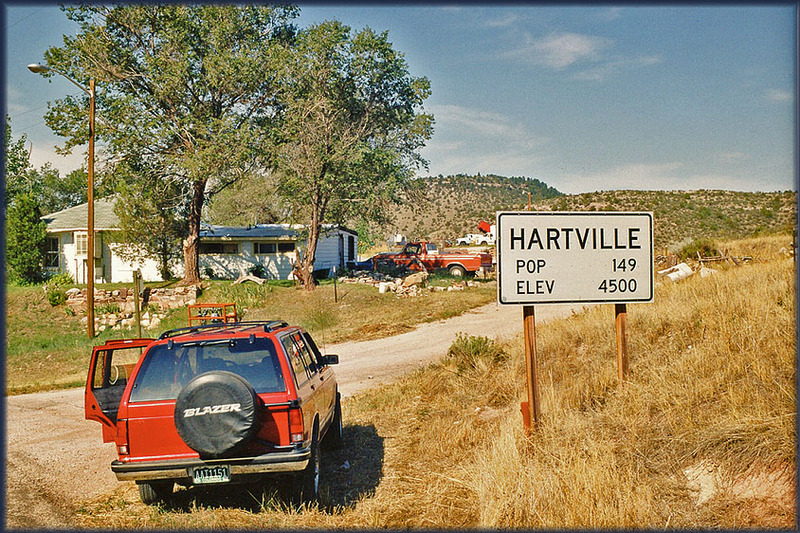 'blue highways'; Hartville,WY pop. 149 sounded just like the place to visit! 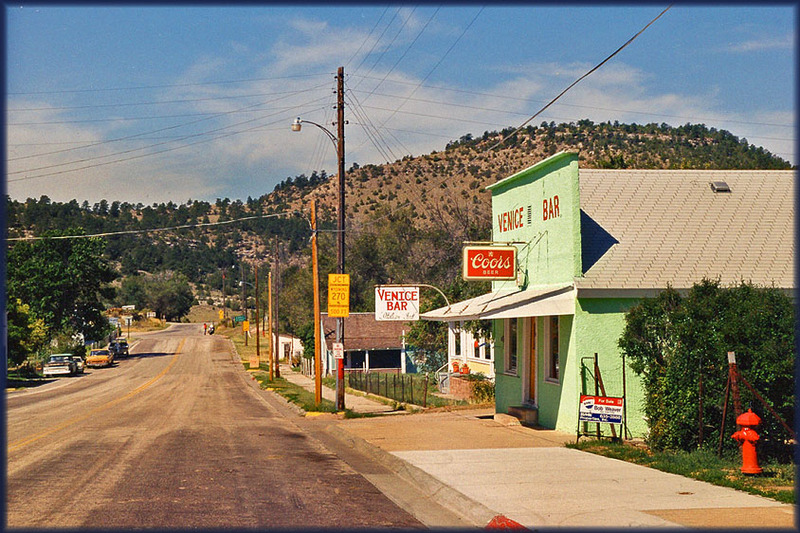 We'd been driving the I-25, past Cheyenne, on our way to the Black Mountains. Never thought I'd encounter 'art-deco' colours in the middle of the 'Wyoming wilderness'..
We took a cool break at the nearby Guernsey State Park. 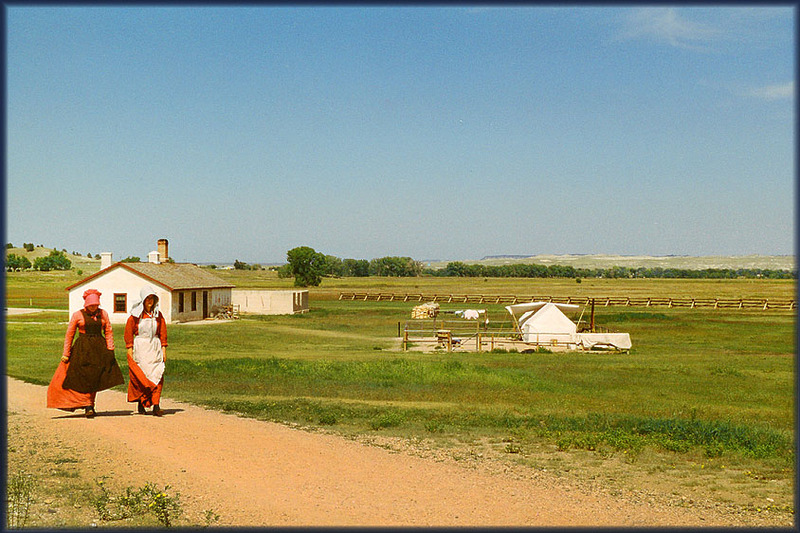 Fort Laramie National Historic Site (www.nps.gov). 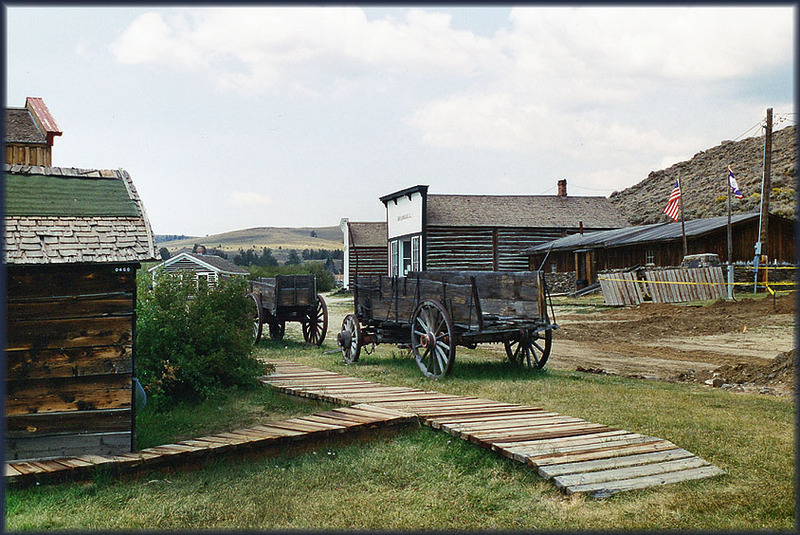 Originally established as a private fur trading fort in 1834, Fort Laramie evolved into the largest and best known military post on the Northern Plains, before its abandonment in 1890. This 'grand old post' witnessed the entire sweeping saga of America’s western expansion and Indian resistance to encroachment on their territories. 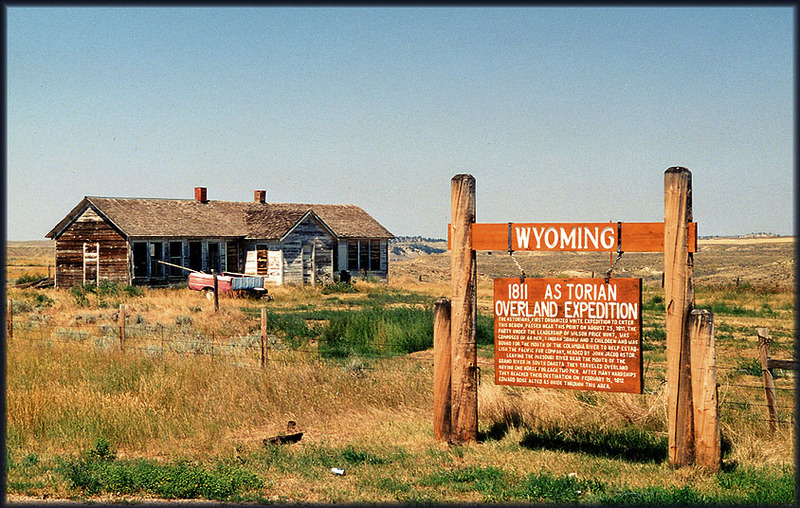 Fort Laramie, an important stop on the Oregon, California and Mormon trails as well as a staging point for various military excursions. 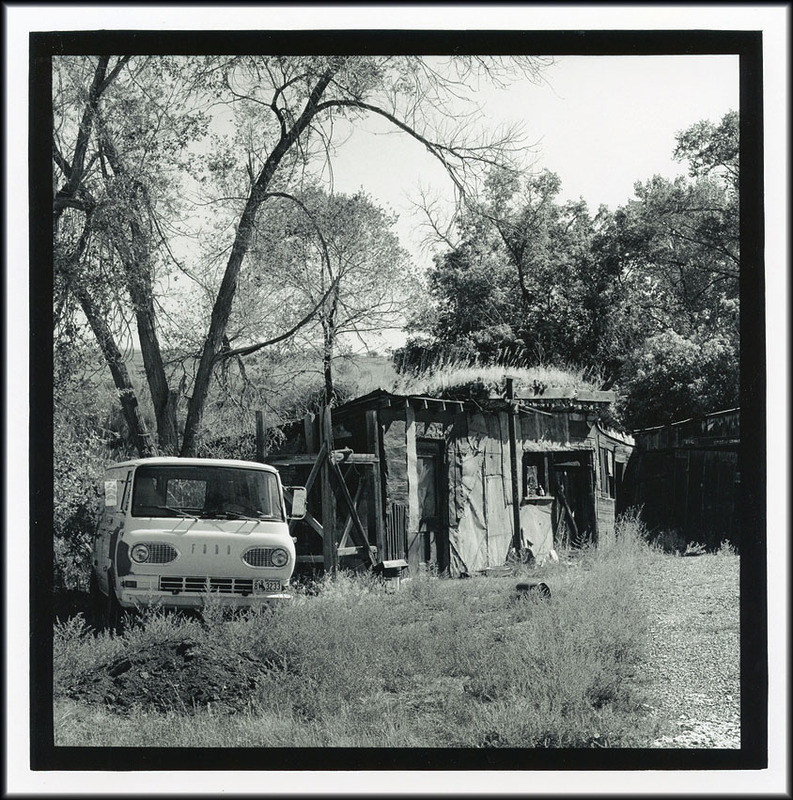 The fort was located across the North Platte River from the current town, at the mouth of the Laramie River. 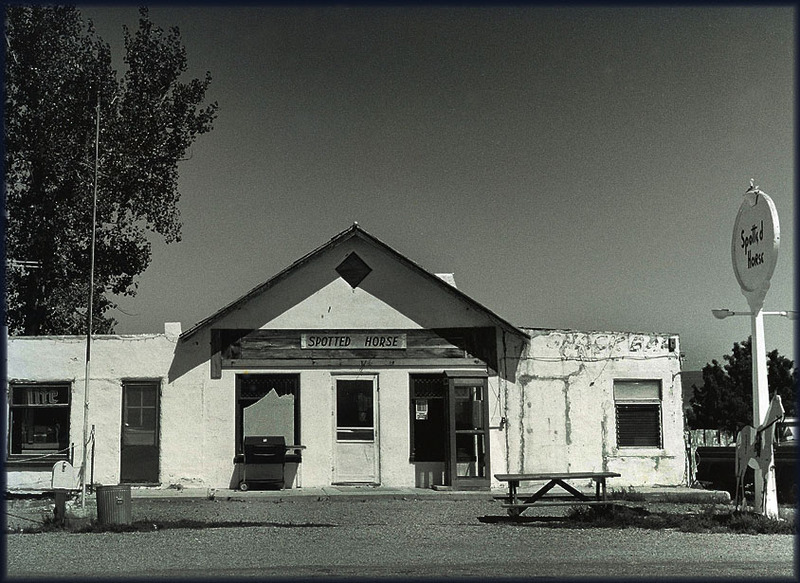 In 1860 Fort Laramie served as a Pony Express station. 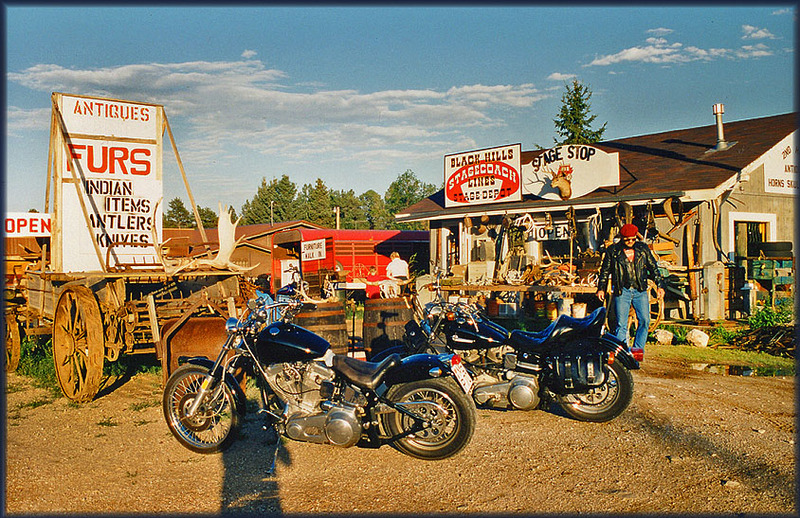 The name Laramie stems from a Frenchmen named La Ramee who died in the nearby river, not by drowning, but by the arrows sticking is his chest..
Driving to the Black Hills, for a visit to Mount Rushmore, we noticed an ever growing number of motorcycles. 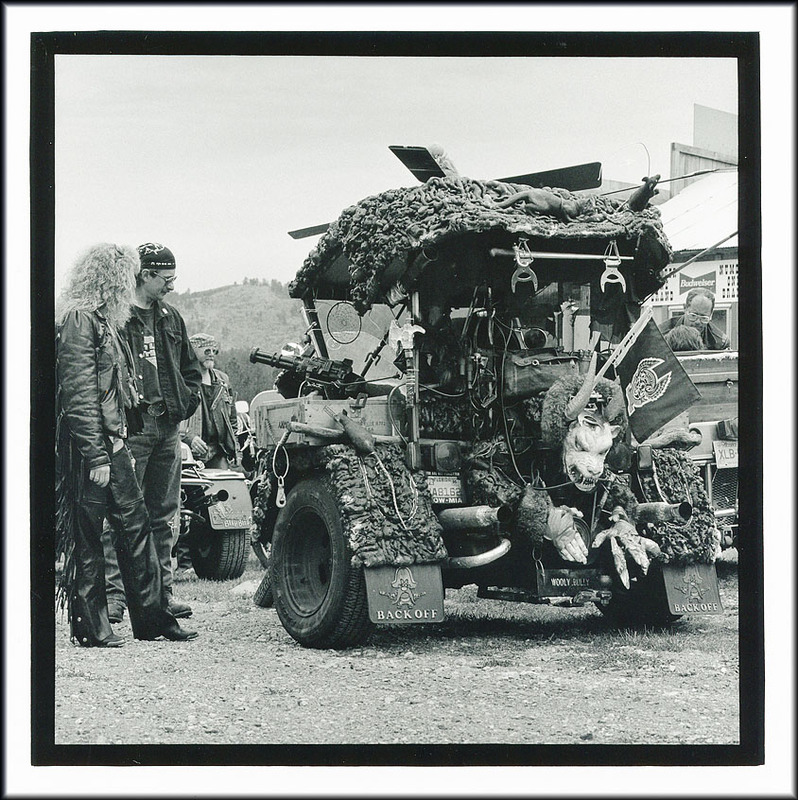 what signified all the motorcycles out on the road: "don't you know about the famous Sturgis Rally?" 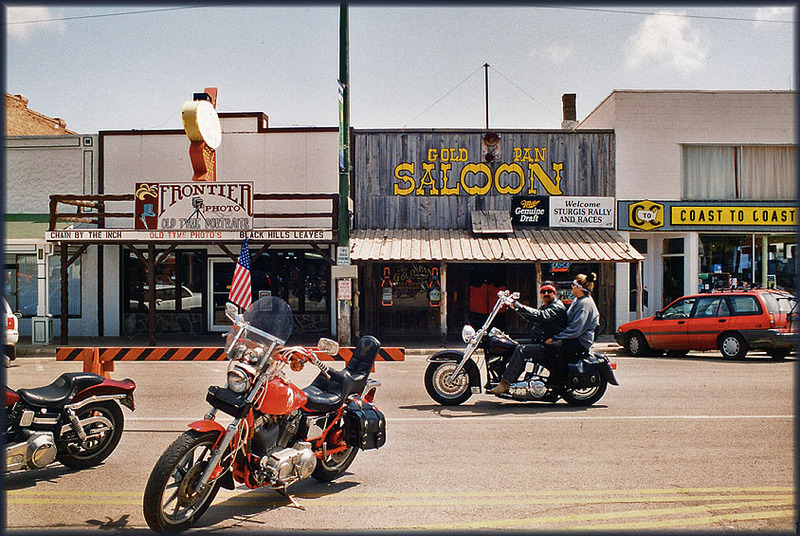 driving their 'iron horses' to this motor meet at Sturgis, South Dakota! 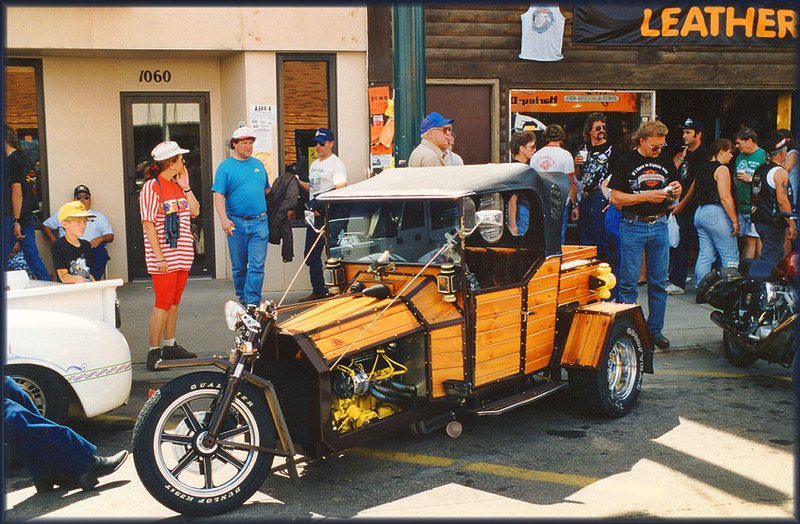 The Sturgis Motorcycle Rally is an American motorcycle rally held annually in Sturgis, South Dakota, usually the first full week of August. 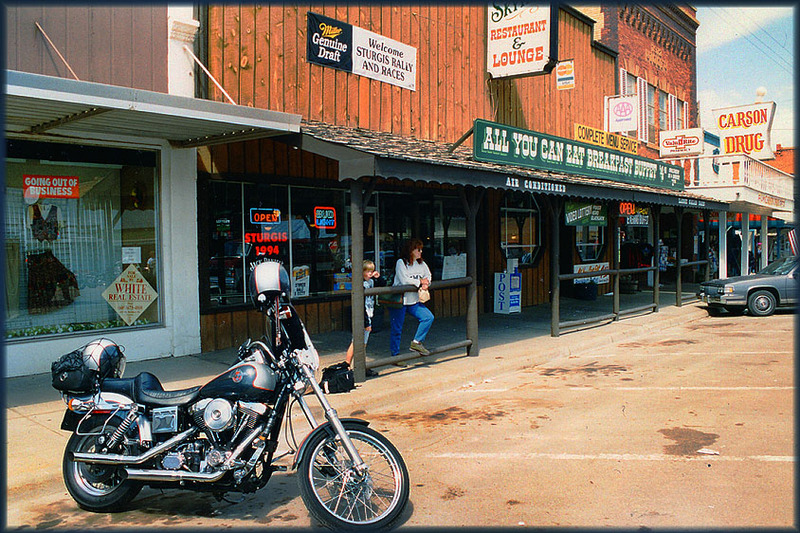 The motorcycles go well with the Ol'West feeling of the town and area. 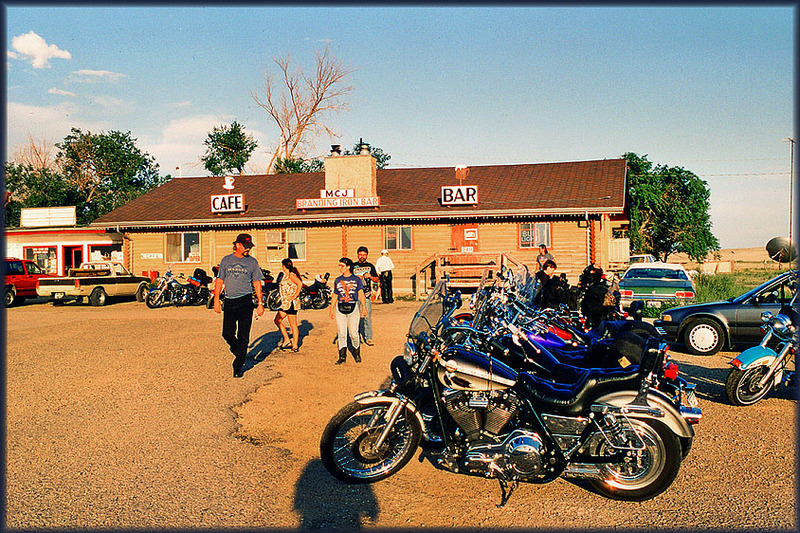 The first rally was held on August 14, 1938, by the 'Jackpine Gypsies' motorcycle club. 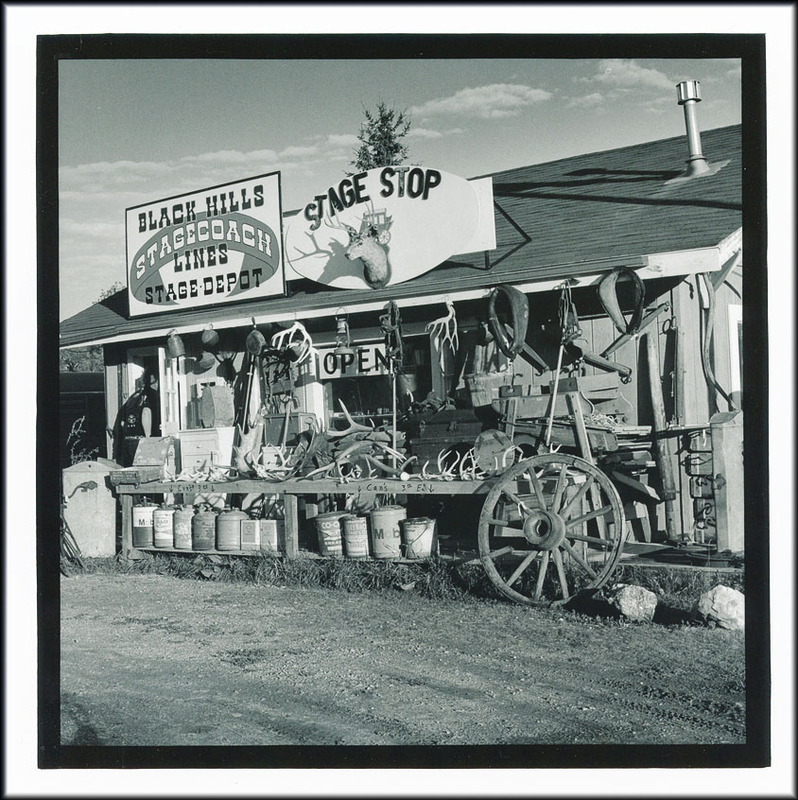 The first event was called the 'Black Hills Classic' and consisted of a single race with nine participants and a small audience. 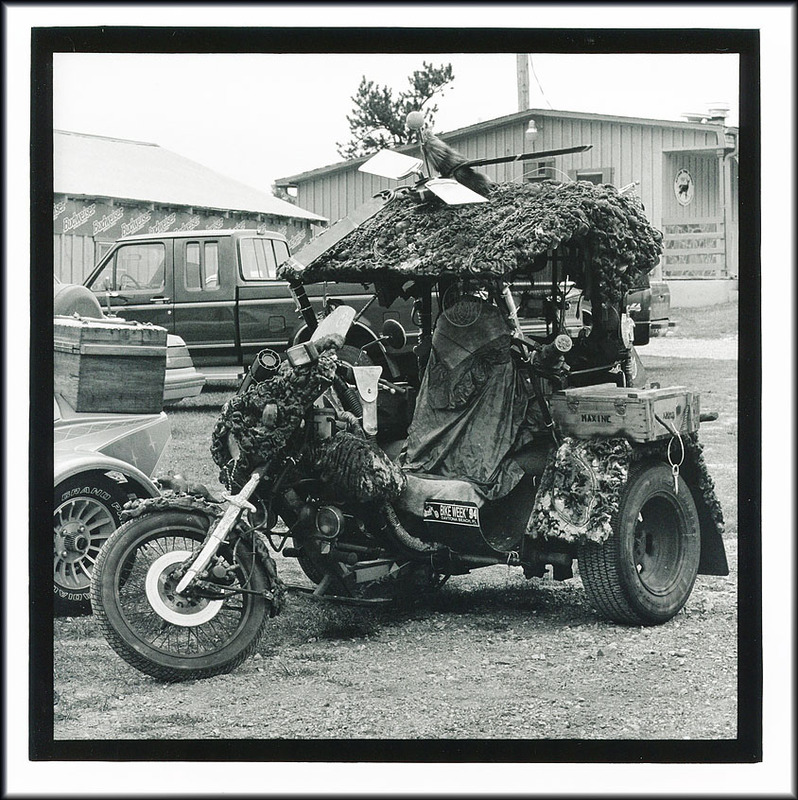 The Sturgis Rally has been held every year, with exceptions during World War II. 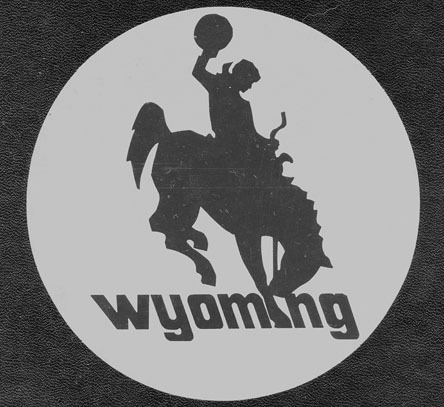 For instance, in 1942, the event was not held due to gasoline rationing. 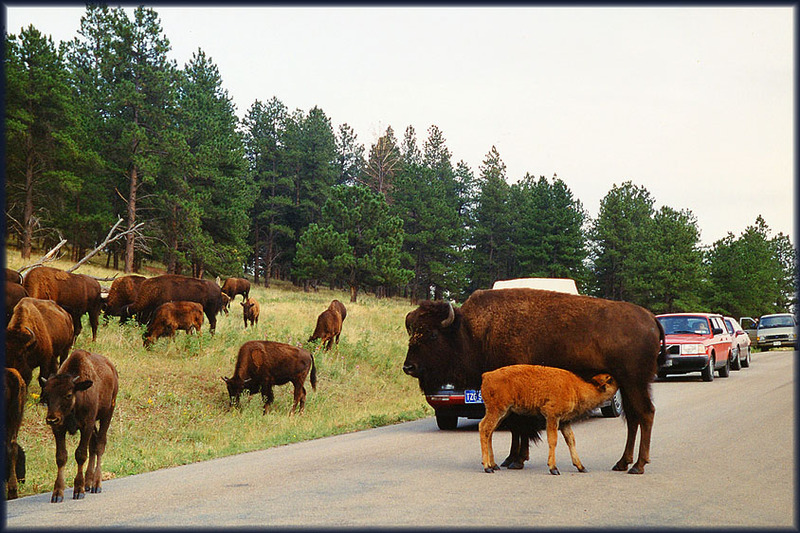 Custer State Park is a state park and wildlife reserve in the Black Hills of southwestern South Dakota, USA. 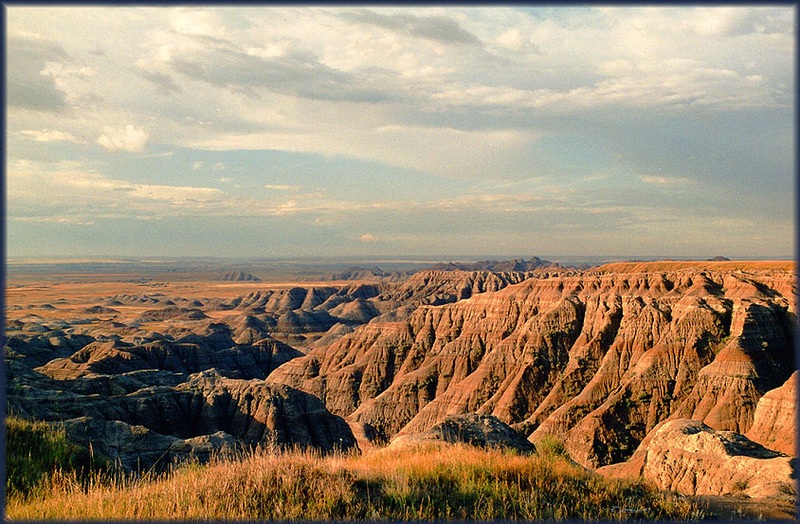 The park is South Dakota's largest and first state park, named after Lt. Colonel George Armstrong Custer. The park covers an area of over 71,000 acres (287 km2) of hilly terrain and is home to many wild animals. The park is home to a famous herd of 1500 free roaming bison. Elk, mule deer, white tailed deer, mountain goats, bighorn sheep, pronghorn, mountain lions, and feral burros also inhabit the park. 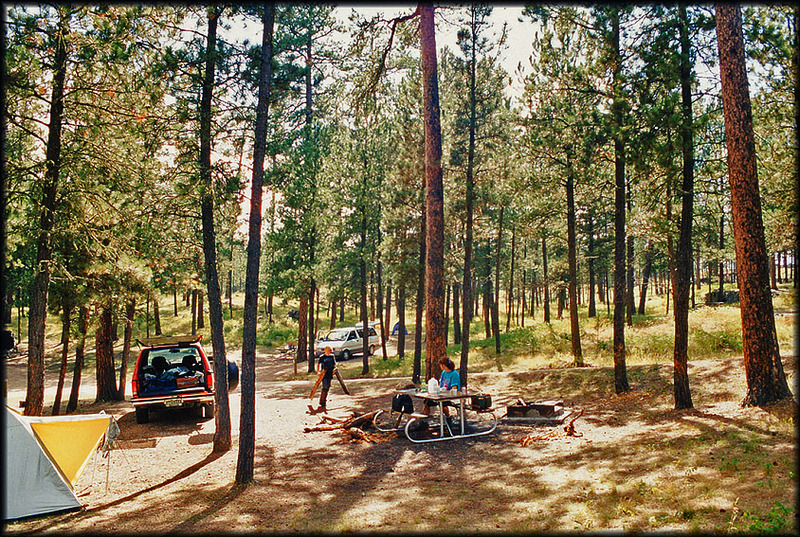 Camping is a great joy here: a lot of space, building a campfire is a normal thing to do here and at night you fall asleep amidst the howling of coyotes! 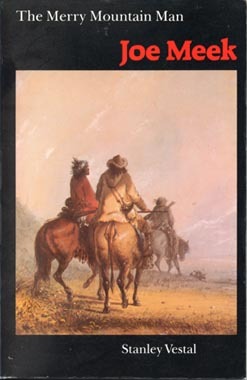 Books by Annie Proulx are an excellent way of getting to know Wyoming. Those bikers are a colourful lot! And what fun they all had! 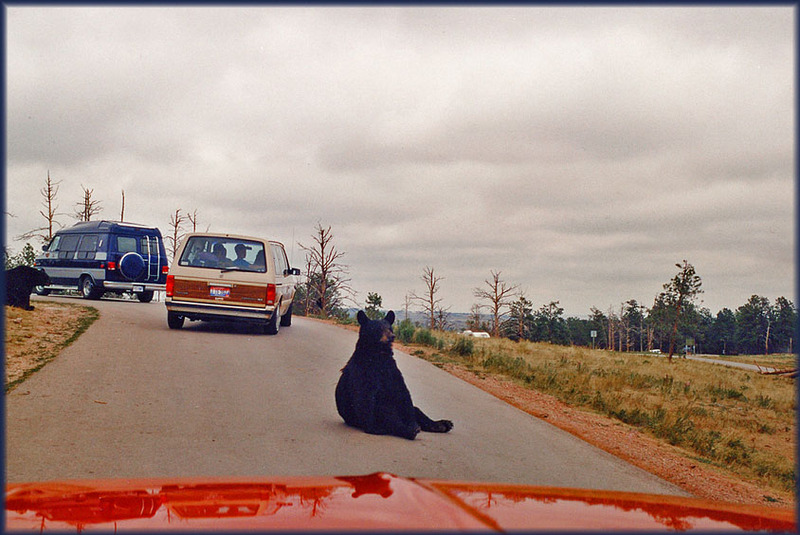 Nestled over 250 acres 8 miles south of Rapid City, 'Bear Country U.S.A.' offers visitors views of most North American mammals. Visitors take a leisurely three-mile drive through several enclosures and encounter black bear, elk, reindeer and other animals; we also saw wolfs, peacefully co-existing with the bears. 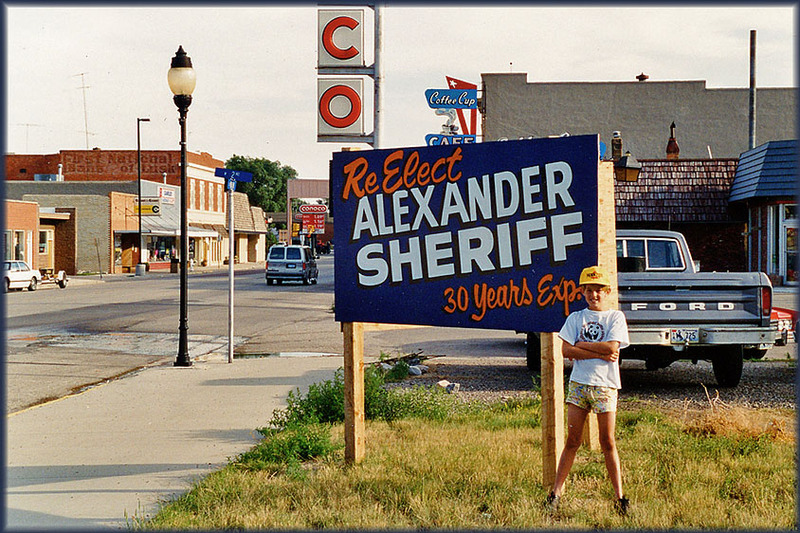 This is Wall,SD. 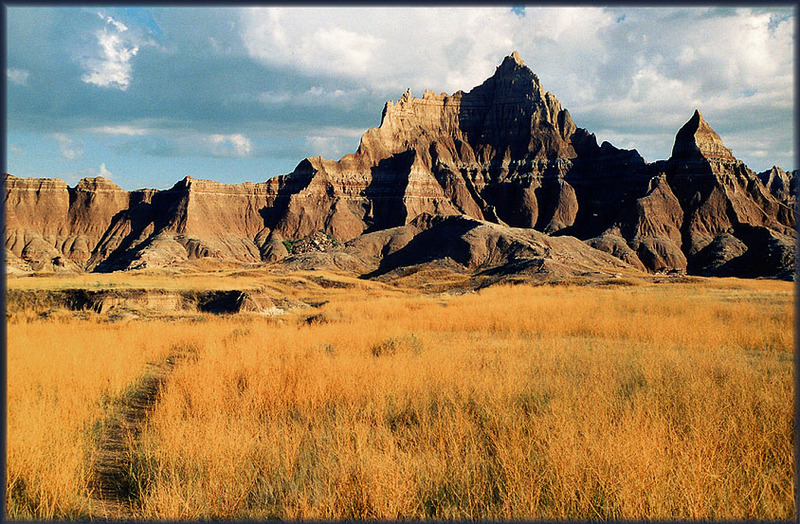 It is the gateway to Badlands National Park. That 'Wall Drug Store' is the mother of all souvenire shops, it is huge! A dark storm was brewing and limited our browsing in town, seeking shelter against the wind, rain & hail in a nice motel: no sleeping in the tent tonight! 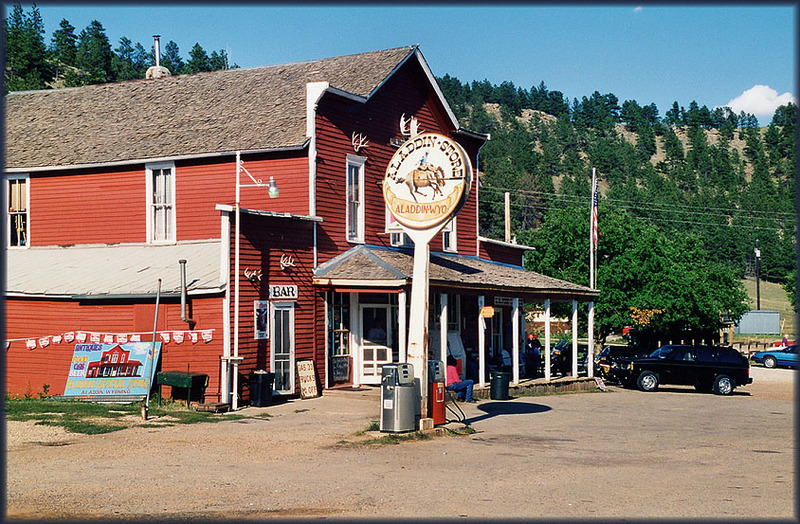 Storms pass and these Trading Posts in the Black Hills were a lot of fun to browse. 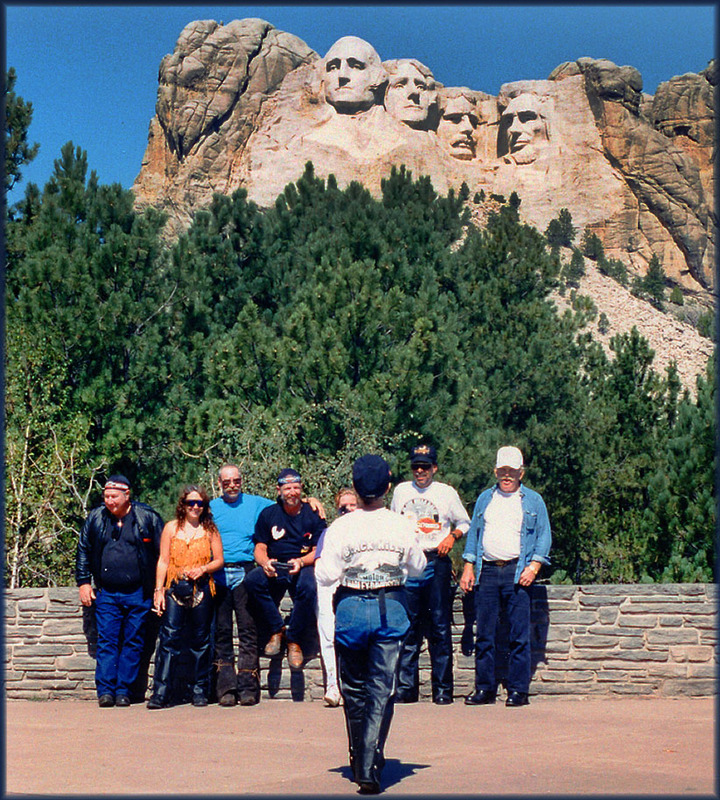 And everywhere we went we heard that typical Harley Davidson sound passing..
MORE PHOTOS TAKEN IN STURGIS HERE..
Badlands NP, very impressive scenery. Stops like these are priceless. 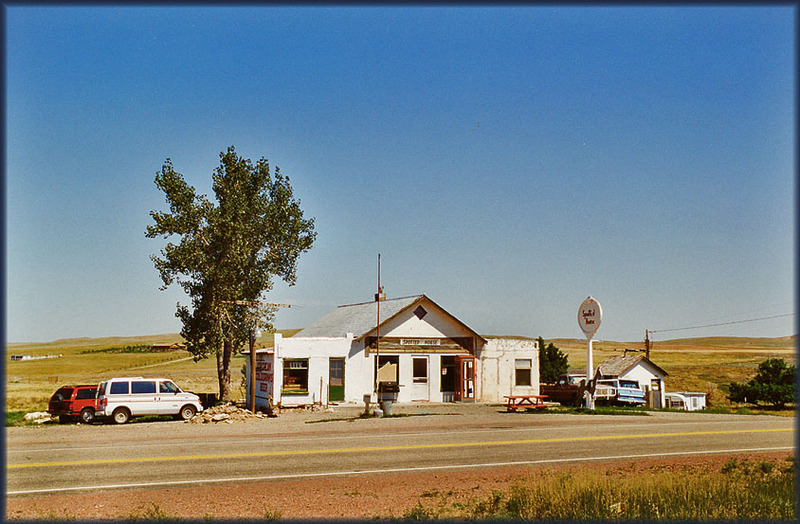 This is the Aladdin General Store, on WY Route 24. 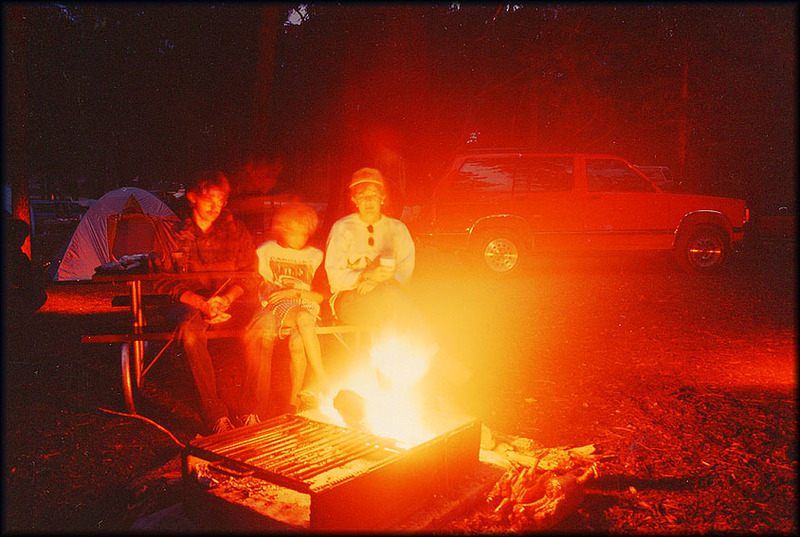 We spent a lot of time in the car, a nice Chevy Blazer. We stopped at lakes and streams so we could stretch our legs and get some exercise; camping got us out too. 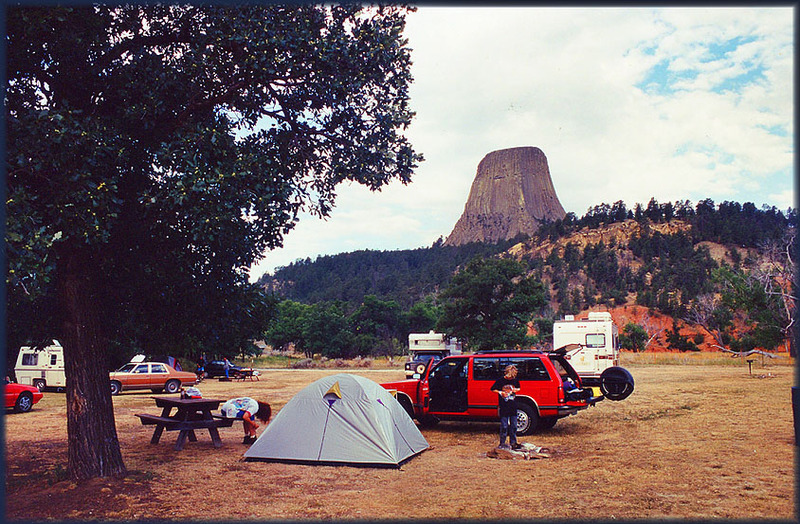 We camped here at Devil's Tower National Monument, which is a remnant of a volcano! provided by the National / State Forest Service (with just a shithouse, firepit and water). Spotted Horse. We were the only guests. 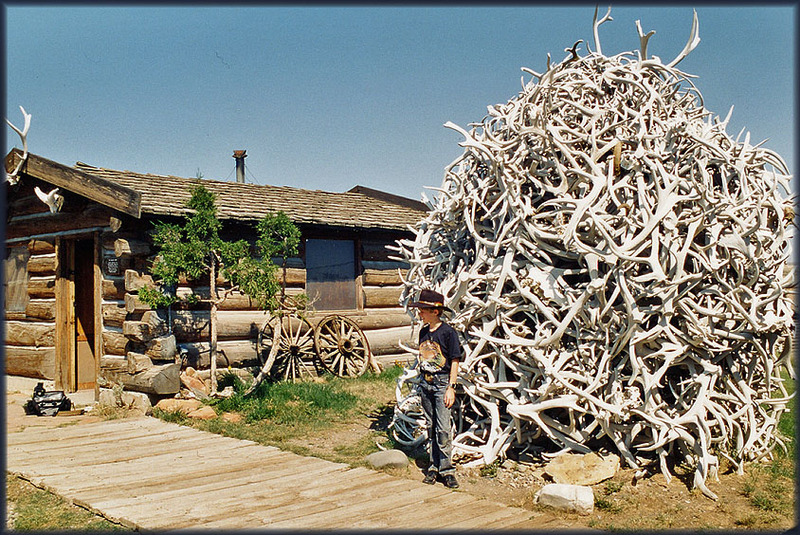 The owner had bought this ranch, sold the cattle which paid for the purchase and then some.. Other farms had a hard time too: breeding deer had replaced cattle in many places. The Astorians, first organized white expedition to enter this region, passed near this point on August 25, 1811. The party, under the leadership of Wilson Price Hunt, was composed of 60 men, 1 Indian squaw and 2 children and was bound for the mouth of the Columbia River to help establish the Pacific Fur Company, headed by John Jacob Astor. Leaving the Missouri River near the mouth of the Grand River in South Dakota, they traveled overland having one horse for each two men. After many hardships they reached their destination of 15Feb1812. Edward Rose acted as guide through this area. 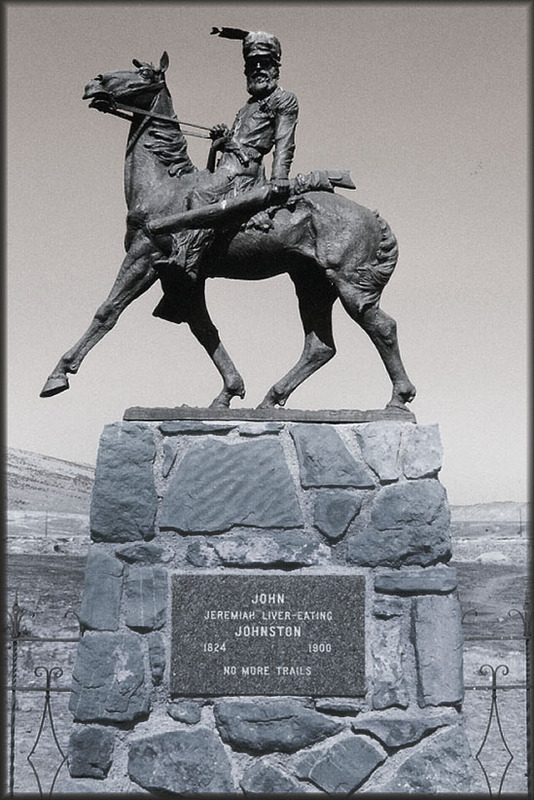 Guided to Jackson Hole by John Hoback, after whom the Hoback River was named, the expedition then left Wyoming over Teton Pass. 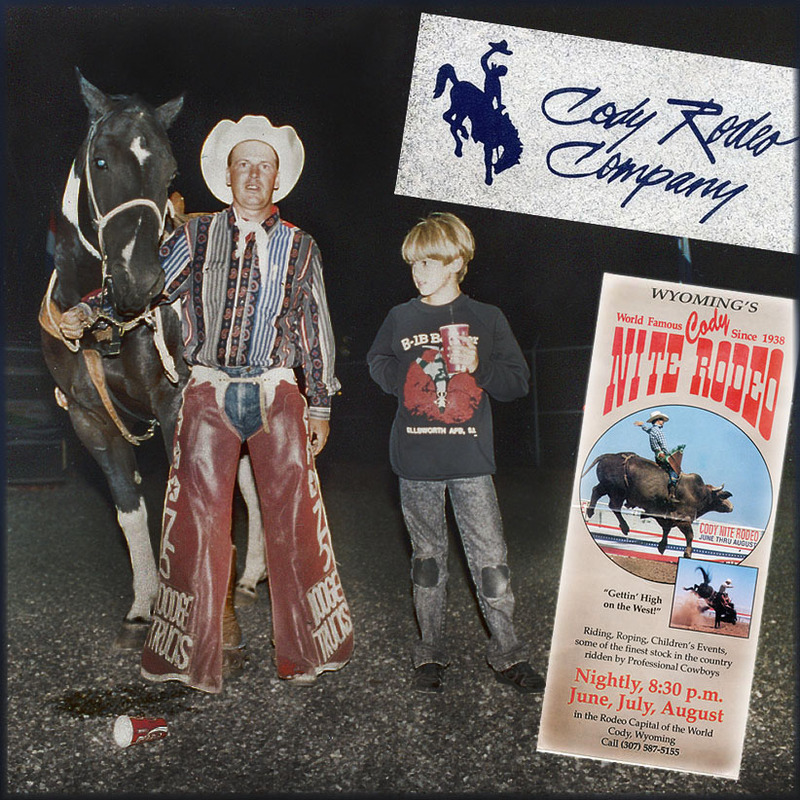 roping and bull riding, the works! It was great fun, but darkness made photography virtually impossible. We continued on the Old West Trail... 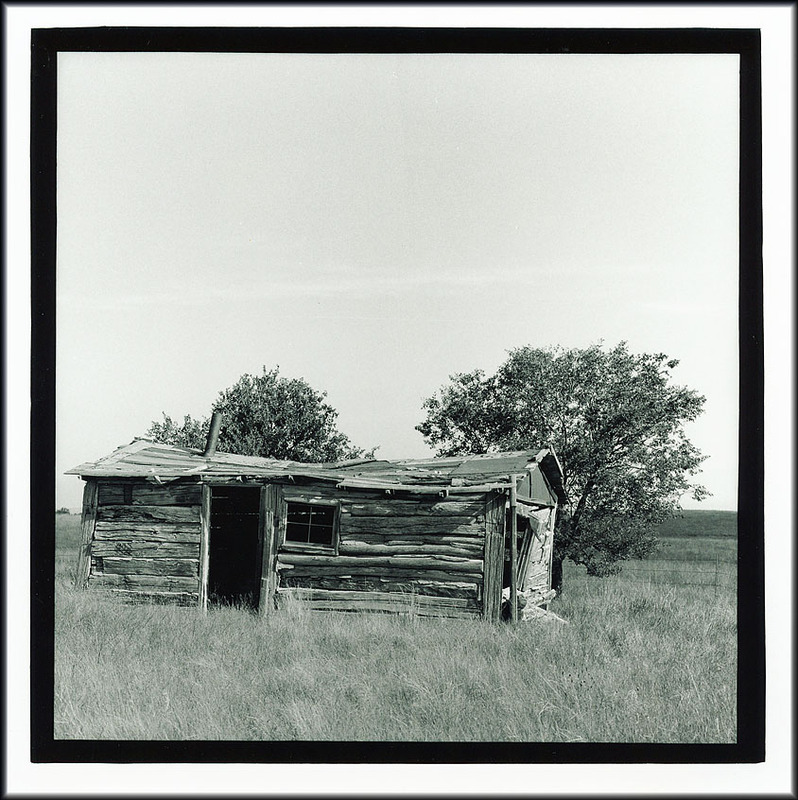 This was in Cody and was actually compiled from cabins from the area, reassembled here, furnished with clothing, furniture, cookery utensils, etc from the 1800s. At this site a number of trappers who died in the wilderness have been reburied here. John 'Liver Eating' Johnston is the most famous of all. Farmer, sailor, teamster, trapper, hunter, guide, scout, deputy, Union Private, trader, and more! A frontiersman born in New Jersey, sailing the seas then digging for gold in the Montana Territory and continuing to live a robust, adventurous life in the west dodging arrows, bullets, fists, weather, animals, until the frailty of old age came upon him. He was noted to be surly, extremely strong and a loner. But did you know his birth name was Garrison?! Visit to Yosemite National Park. Signs outside the park advertised 'campgrounds full', so we camped outside the park at the Three Mile Campground, next to the Shoshone River. We ventured into the park on daytrips twice. It was only three miles to the park entrance but it took some 3 hours to get anywhere; at night (sunset / sunrise) that entrance closed, so we had to take that in account too. No time for long hikes on trails. It was cold at night, around freezing (Celsius). 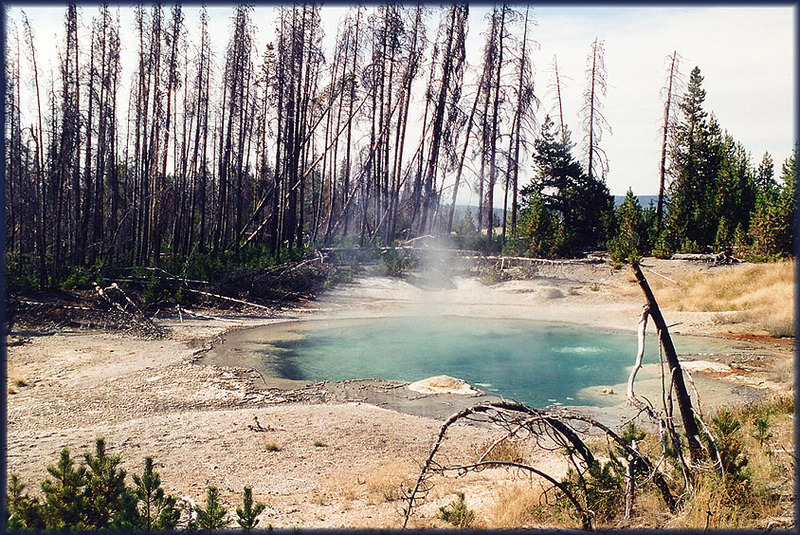 There is much scenic beauty in these smelling, steaming ponds..
Yellowstone National Park is home to some 10,000 thermal features, over 500 hundred of which are geysers. 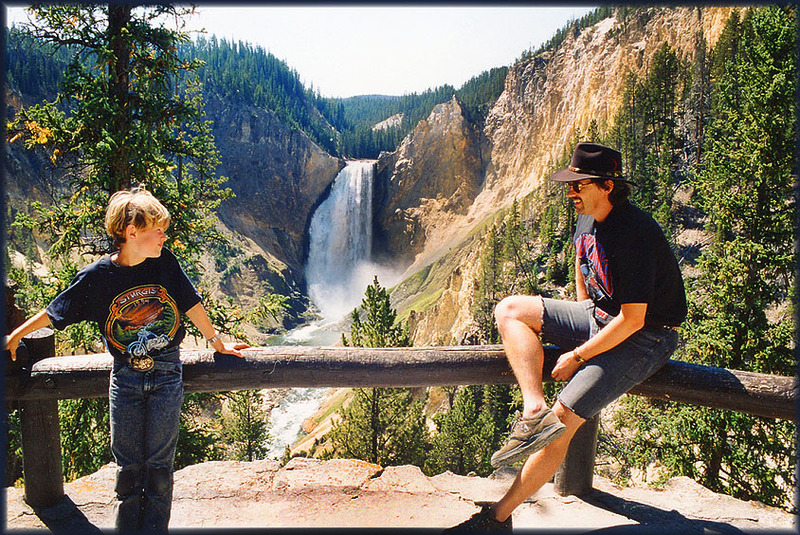 In fact, Yellowstone contains the majority of the worlds geysers. 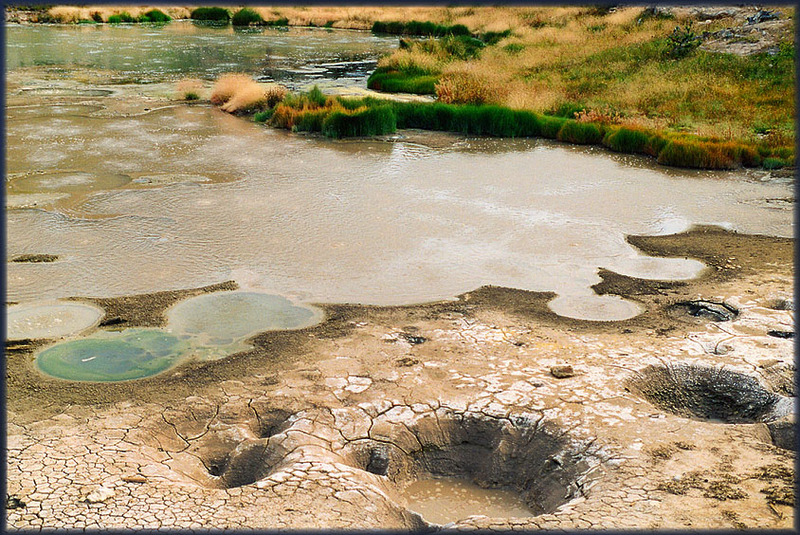 Within Yellowstone’s thermal features can be seen the product of millions of years of geology at work. 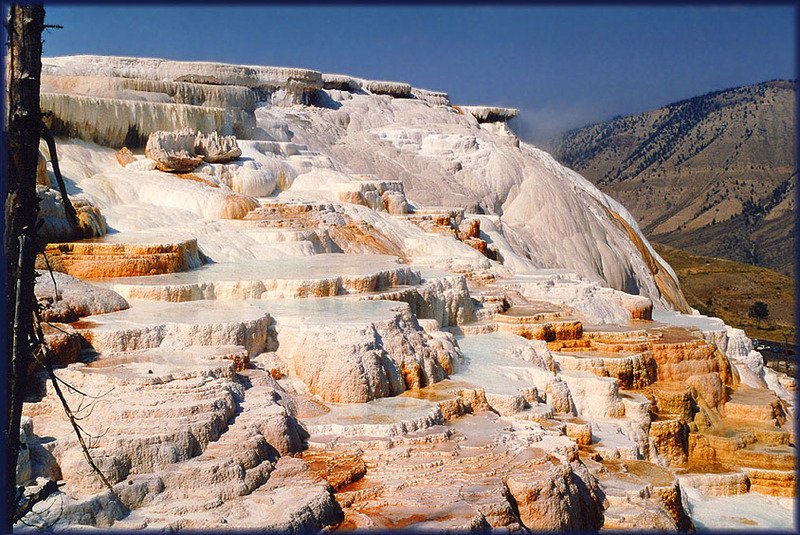 Mammoth Hot Springs, delicate art by Mother Nature. We visited Yellowstone NP again in 2014 and noticed this had turned all grey; the same but different. You better take that sign serious! 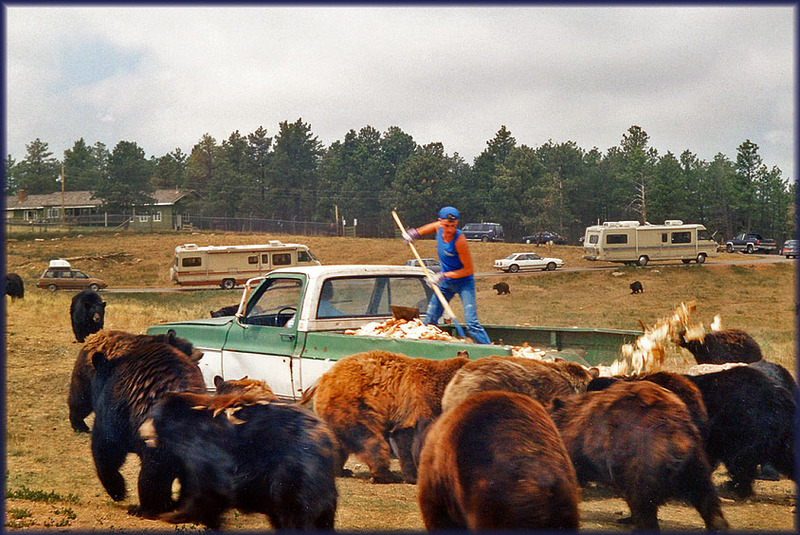 The buffalo was first and foremost of utmost significance to people of the plains and prairies. 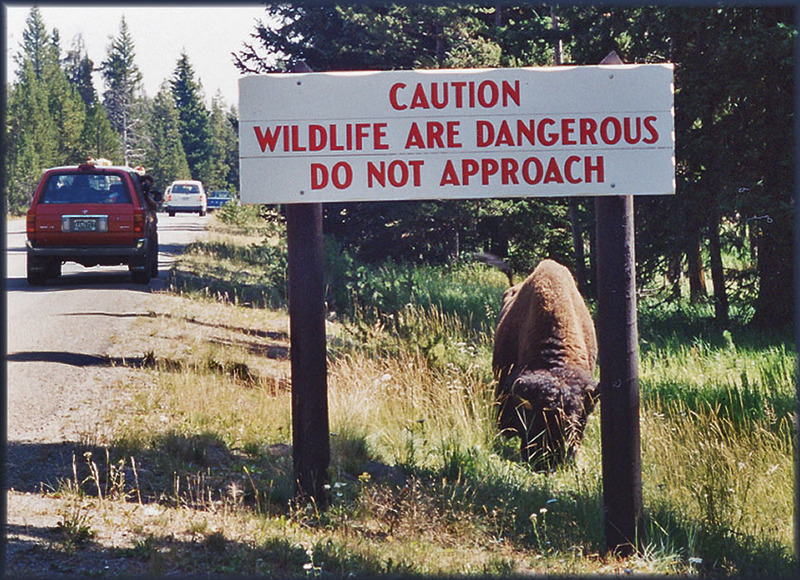 No story of wildlife decline in North America is more widely known than the demise of the buffalo. It is one of the most important stories in the environmental history of North America. Buffaloes once ranged much of the North American continent: from the east to west coasts, and from Canada's Northwest Territories in the north and Mexico in the south. The press of new people arriving from Europe soon resulted in the Buffalo's extermination in the peripheries of their territory; east of the Mississippi they were extinct by 1833. 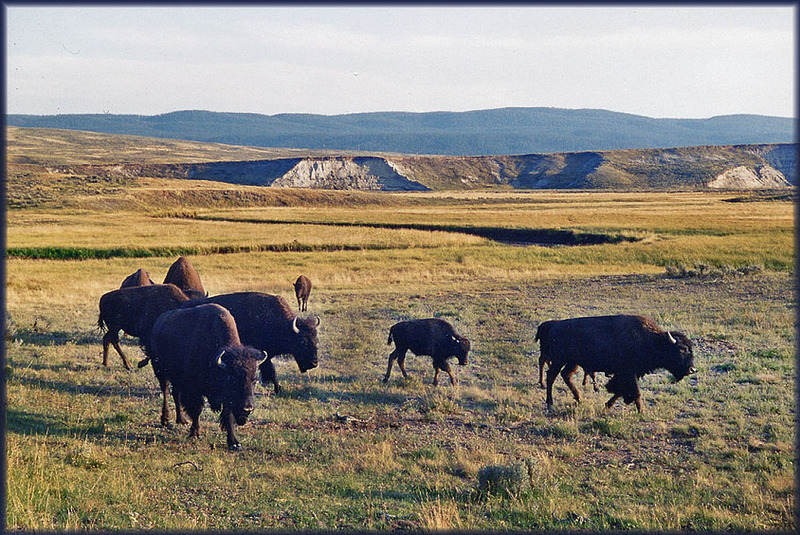 For thousands of Plains Indians (people like the Blackfeet, Gros Ventre, Assiniboin, Crow, Cheyenne, Shoshoni, Arapaho, various Sioux or Dakota people, Comanche, and others), the buffalo was unquestionably paramount. The massive decline of the number of Buffalo was a tragedy for them, unfortunately it wasn't the only tragedy in Indian culture. In 2014 we visited the National Bison Range, have a look! From Lander we undertook a fantastic scenic (loop) drive, sometimes negotiating patches of unpaved dirt road, over Sinks Canyon Rd and Louis Lake Rd, through Grand Teton NP / Gros Ventre Wilderness. ... and South Pass City. 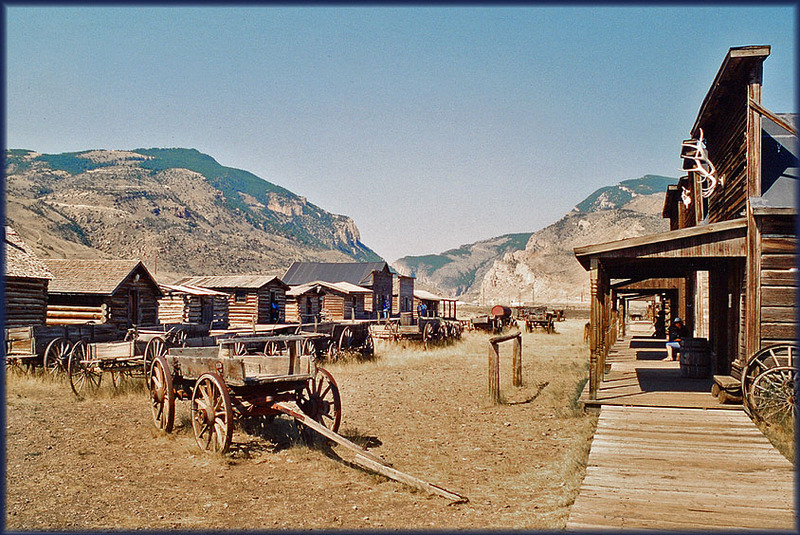 A historic stop about 10 miles north of the Oregon Trail and a once bustling gold mining camp, South Pass City is one of the best known ghost towns in Wyoming, as well as one of the most authentic old settlements in the American West. 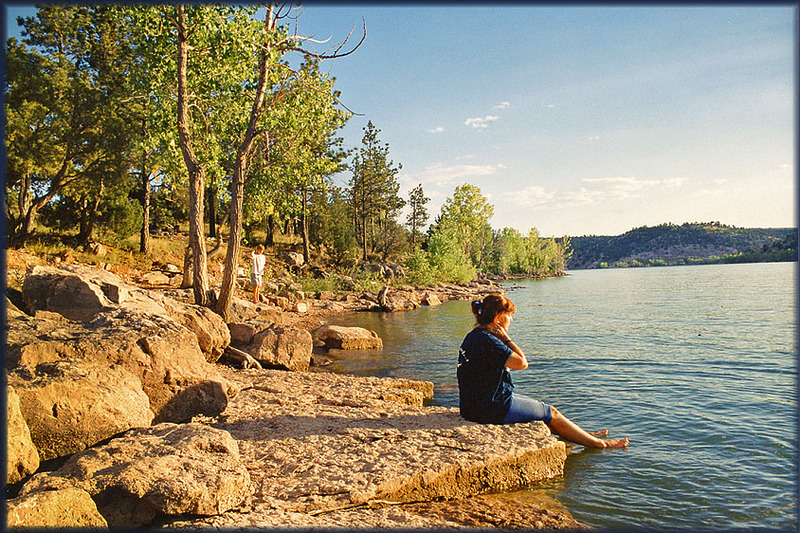 Situated in a small valley along the banks of Willow Creek on the southeastern end of the Wind River Mountains, South Pass City got its start in the summer of 1867 when gold was discovered in the Wind River Mountains by a group of Mormon prospectors. Though the precious mineral had already been found in small amounts in Sweetwater Creek, as early as 1842, the isolated region was primarily occupied by Arapaho, Cheyenne and Sioux Indians who were quick to attack those who had invaded their homelands. 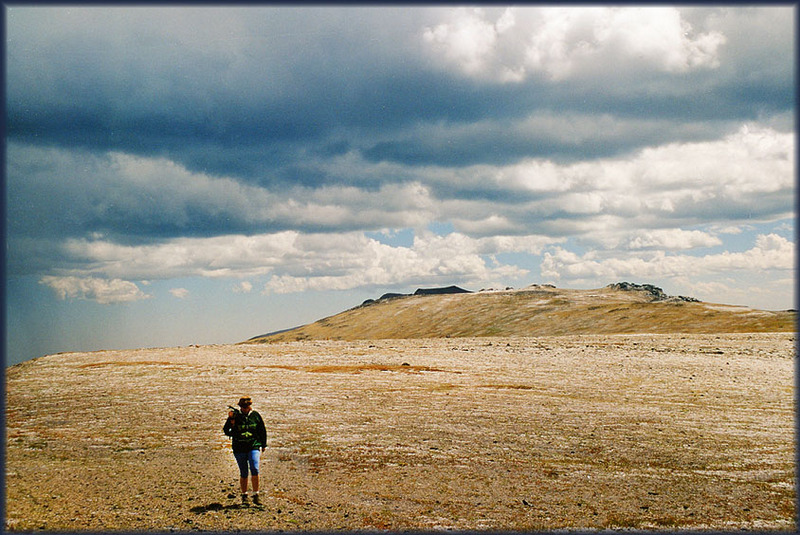 National Park, an exciting drive, crossing the Continental Divide in a storm of wind and hail. August 23rd we took the flight home from Denver, it had been an excellent trip in all respects.